The saying "Parangiya Kotte Giya Wage" is embedded in our folklore and proverbs; it may not be historically authentic yet it has found a place in our commentaries of the ancient kingdom of Sri Jayewardenepura as an amusing episode in the first days of Portuguese occupation of Ceylon's strategic port city of Colombo. The humorous tale was perhaps fictionalised and authored by Robert Knox, but its morale was clear : the Sinhalese king of Kotte, obviously apprehensive following the sudden arrival of some foreign White invaders with a military design to conquer the little island, was so naïve as to instruct his Sinhalese soldiers tasked to lead the Portuguese to the kingdom of Kotte to take the Parangiyas through a circuitous, long route so that they will not know where the Kotte kingdom lay and how to reach it. The first Portuguese men going to meet the king of Kotte must have been thoroughly amused, for they were armed with compasses, yet perhaps chuckling followed the Sinhalese escorts. And so, the legendary saying was born. It is as hilarious as the other old saying that Sinhalese warriors on a reconnaissance trip to Colombo fort reported that they witnessed the Portuguese "eating bricks ( bread ) and drinking blood (wine)." Just mirthful, unsubstantiated tales directed at the naivete of the Sinhala people, their foolishness. Yet these fictitious stories do not undermine the heroics of the people of Sri Jayawardenepura or Kotte. Just a few metres past the Mirihana police station is the vantage Jubilee Post. People outside the vast sprawling town of Nugegoda perhaps have no idea what the quaint and even funny name Jubilee Post means. At the turn of the main road running down to Nugegoda town there stood a small, cement, crude memorial apparently erected to commemorate the Jubilee year of Queen Victoria ( Ceylon's sovereign and also the Empress of India.) It had been lying face downward for years neatly forgotten by all. Then an enterprising journalist saw it and wrote a story. Almost overnight the fallen memorial came to life. It was given a halfhearted whitewash and re-erected. And the name Jubilee Post continued its usage. It is there in its original place now but nobody bothers even to steal a glance at it. Before the Jubilee Post proper set on a small roundabout is a statue of Parakrama Bahu V1 - the ancient king who ruled from Kotte the entire island for more than fifty years. The most significant aspect of his reign besides his numerous battles even overseas was his ardent love for art and literature. They flourished as never before in the entire kingdom of Kotte. He virtually was a foster father for the great poet-monk Thotagamuwe Sri Rahula. He brought the scholarly priest who was nothing short of a genius under his personal care and urged him to write his verses which are considered classics even today. Sri Rahula's vivid description of Kotte as it was then moves rhythmically like the echoes of a splendid symphony. The poet brought to life in the most amorous style the enchanting and dazzling beauty of the damsels of Kotte. Those verses evoke the eternal romance of the kingdom. Sri Rahula also captured in poetry the era of the great king Ravana. In some verses he spoke strongly about the notorious betrayal of Ravana's brother Vibhishana who turned traitor and joined Rama and fought against Ravana in order to become the king of Lankapura. After Parakrama Bahu's death in ripe old age (the statue at Mirihana's Jubilee Post portrays the monarch as a frail and enfeebled king) the Kotte kingdom declined. The Portuguese made periodical forays but it was not completely subdued. King Rajasinghe's valiant battles against the invaders from Lisbon are recorded historically as heroic struggles. In Pita Kotte there is an abandoned, disused Ambalama - a pilgrim's rest. Underneath it, they say, there is a hidden tunnel unexplored. According to unwritten history the tunnel leads to Colombo Fort and King Rajasinghe had dug the tunnel to be used by Sinhalese soldiers from Kotte to attack the Portuguese in Colombo. The Sinhalese crept through the tunnel and emerged at Pettah where they fought some ferocious battles with the Portuguese. 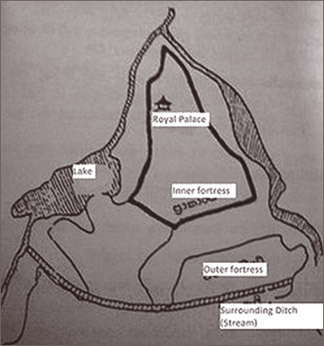 The Sinhala novel "Sunethra " written by W.A.Silva describes how the Sinhalese soldiers seized Portugese fighters and dragged them through this tunnel back to Kotte kingdom. Modern Kotte has changed but its old, glorious history returns majestically as the picturesque Diyawanna Oya flows along the banks of Etul Kotte taking its waters through the ancient kingdom to the Wellawatte canal and then to the sea. Diyawanna Oya has its own folk chronicles which may be fact or just village gossip. It has been sometimes dubbed as " a lover's leap" There is a poignant story how two lovers frustrated by severe objection from the parents vowed to end their lives by drowning in the Oya. But the man betrayed her by checking himself and fleeing after the woman drowned. Villagers claimed that in the middle of the night they heard the wailing cry of the dead woman - perhaps her apparition. However, there had been instances of drowning in the Diyawanna Oya. Diyawanna Oya has now been turned into an excellent tourist attraction. The two most modern additions to Kotte are the aesthetically wonderful Parliament complex and the Japanese-gifted Sri Jayewardenapura Hospital ,both almost on the banks of Diyawanna Oya. When the Japanese who were anxious to repay their gratitude to President J.R.Jayewardene for his historic speech at San Francisco asked the former President what he wanted as a gift, he said " a hospital at Kotte." " How big ?" the Japanese asked. "The 1 is for me," the ex-President replied quizzically. The Japanese gave 1001 beds, but Mr.Jayewardene never used the extra bed. Instead it was used by the late Lalith Athulathmudali following the bomb attack in Parliament.